I wrote everything from yesterday up and posted it, only to have my blogging app somehow eat the whole things and fart it out into the interwebs somewhere. But maybe it was for the best because I'm not sure how coherent I was last night anyway, so I'll try again with the more prosaic version. We started out at Culloden (the battle that marked the end of Scotland's fight for independence). Scottish history is so intervowen with Englan'd's that it's hard to tell where the good guys begin and the bad guys end. 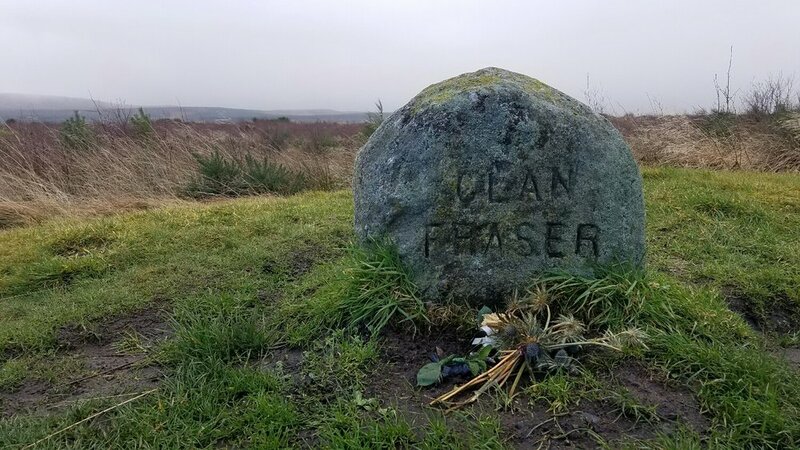 If you've read or watched Outlander, then you feel like you witnessed it first hand and it's particularly sobering. I managed to so overwhelm the gift shop cashier with questions, she snagged on of the historians on his way to lunch and the poor man answered all of our questions. Here's my tidbit from today. Clan tartans and kilts didn't exist until the Romantic Era when it became legal again for Scots to wear them. In fact, I'm not sure the tradition would be so popular today if Scotland hadn't spent a galling centry and a half with tartans forbidden. There's something about being told you can't do something, that makes you value it even more. The government should have known better. But after Culloden, the townspeople were forced at gunpoint to bury the three day old field of dead bodies. They separated them by clans and buried them in mass graves. 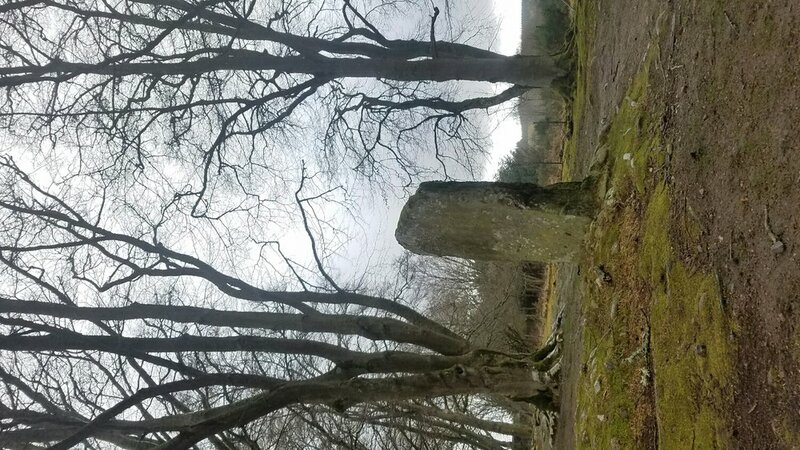 The grave locations were passed down generation to generation for a hundred years until they were allowed to put up a gravestone for each clan. How did you know who was in which clan though if they weren't wearing clan tartans? The answer is they pinned sprigs of greenery on themselves that identifiied which family they belonged to, but truthfully they're probably quite a bit mixed up. Grizzly business. English officers gathered up all of the Highalnder's swords and took them to London and used them to make this fence for their garden. 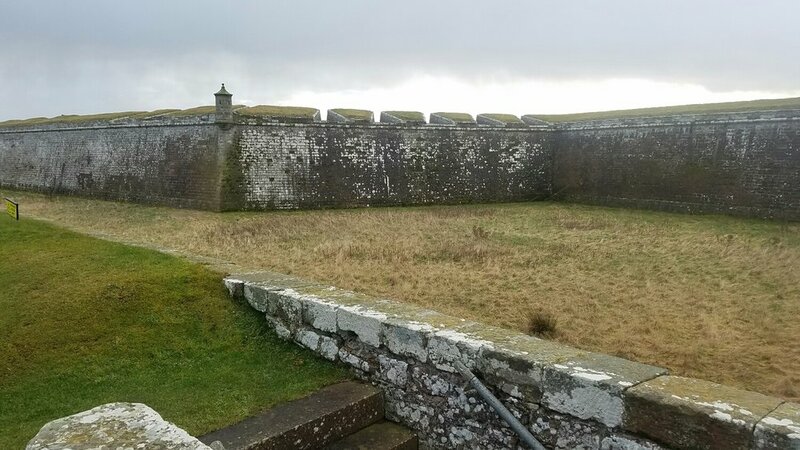 After that we went to Ft. George (the oldest peserved fort in Scotland), but we couldn't convince the grounds lady to let us in, so we slid down grassy hills and crawled around cannons until we got cold and trekked over to a local dairy for some fresh cheese. The cheese was delicious and the conversation even better, but we packed home our extras and phew...the next morning we each wondered if the other had smuggled a dirty diaper into the car. Intense. After that we made our way back to Inverness to our first real hotel in days. It was like the Ritz Carleton in comparison, sitting under the shadow of the castle and cathedral sporting fancy things like hot showers and no patchouli and weed smell. We're getting spoiled.